On March 19-22, the country will witness the rebirth of its athletics glory. The Philippine Athletics Track and Field Association (PATAFA) will be staging, after a five-year absence, the 2015 Philippine National Open-Invitational Athletics Championships at the San Luis Sports Complex in Sta Cruz, Laguna. The Open will be hosted by the Laguna Provincial Government through Gov. Ramil Hernandez with the PATAFA as a partner co-host. The Philippine National Open-Invitational Athletics Championships is the centerpiece sport event of PATAFA. It is an annual track and field competition showcasing the athletic prowess of current members of the national athletics team pitted against the best of the best across the archipelago. This year, expected to provide formidable competition are over 3,000 up-and-coming and powerhouse track and field athletes all over the Philippines plus invited top-notch athletes from neighboring Asian countries. The National Open will feature outstanding athletes from China, Chinese Taipei, South Korea, Hong Kong, Brunei, Thailand, Malaysia, Vietnam, Singapore, Indonesia, Myanmar and the Philippines. Like most of the invited Southeast Asian countries which are preparing their respective track and field contingents for the 28th Southeast Asian Games (SEAG), the Philippines will use this gathering of the Philippines' best in athletics as one of the, if not the final tryouts for coveted slots in the Philippine team to the Singapore SEAG. 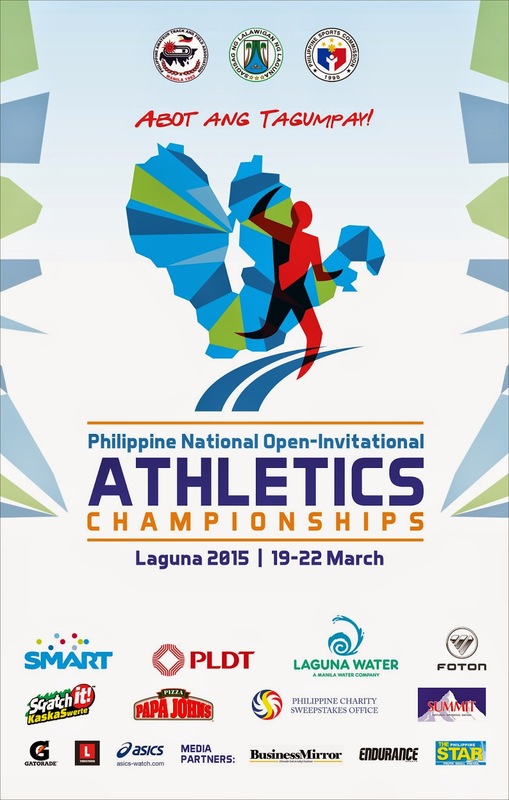 The 2015 Philippine National Open-Invitational Athletics Championships is supported by the Philippine Sports Commission with major sponsors Laguna Water, Pacific Online Scratch It KaskaSwerte, Papa John’s, Foton Philippines, PCSO, Smart, PLDT, Summit Natural Drinking Water, minor sponsors SSS, PAGCOR, Milo, Gatorade, L TimeStudio, Asics Watch, and media partners Buisness Mirror, Endurance Magazine, and The Philippine Star.